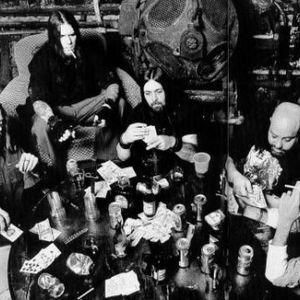 Down formed in 1991 with vocalist/songwriter Phil Anselmo of Pantera, guitarist Pepper Keenan of Corrosion of Conformity, second guitarist Kirk Windstein of Crowbar, bassist Todd Strange of Crowbar, and drummer Jimmy Bower of Eyehategod. All of the band members were long-time friends and were known from their respective bands, making them a supergroup. The band made a three track demo for underground trading. The band members would ask heavy metal fans if they have "heard of this band Down" and give them a copy of the tape without telling the person that they were in the band.Eventually, the tape was distributed throughout the United States and Down played a small concert in its hometown. A record executive from Elektra Records was attending the show to find out who the members of Down were. When he found out the members of the band, he signed Down to a recording contract. Down released its debut album, NOLA, on September 19, 1995. Debuting at number 55 on the Billboard 200, the album has been certified platinum by the Recording Industry Association of America.Allmusic reviewer David Reamer gave the album a nearly perfect 4.5 out of 5 stars, praising the songs "Temptations Wings", "Stone the Crow", and "Bury Me in Smoke". Reamer stated "This is a landmark album that combines the talents of dedicated rock musicians, and should be included in any collection of heavy metal music. "NOLA was supported by a 13 date tour, before the band entered a hiatus to return to their respective bands. In 1999, while Down was on hiatus, Strange left the band and was replaced by Pantera bassist Rex Brown. In 2002, Down came back from hiatus to make another record. The band wrote and recorded Down II: A Bustle in Your Hedgerow in 28 "drug and booze induced" days in a barn called "N?dferatu's lair".The album was released on March 26, 2002 and was not received with the positive reviews that appeared when NOLA was released. Blabbermouth.net reviewer Borivoj Krgin stated "Down II appears to have been thrown together more haphazardly, with much of the material falling short of the standard set by the Down's classic debut offering. "Despite poor reviews, the album debuted at number 44 on the Billboard 200.To support the album, Down toured on the second stage of Ozzfest in 2002.The band again entered an indefinite hiatus to focus on their respective bands. Newly signed to Warner Bros. Records, Down once again reformed in 2006. The band wrote an album throughout the course of a year. Lyric topics on Down III: Over the Under were written about many subjects such as the breakup of Pantera, the murder of ex-Pantera guitarist Dimebag Darrell, the band's anger at the aftermath of Hurricane Katrina, and Anselmo's recovery from back surgery and drug addiction.Debuting at number 26 on the Billboard 200, the album was released on September 25, 2007 to generally positive reviews.Kirk Miller of Decibel Magazine stated "For almost an hour, it's like the metal world was set right again." Down preceded the album by touring with Heaven And Hell and Megadeth, and supported the album performing on a headlining tour starting at the end of September 2007. On April 22, 2008 the BBC Radio1 Rockshow broadcasted a new session of Down recordings featuring alternate versions of NOD, Beneath the Tides, and Jail, along with a cover of Led Zeppelin's version of When The Levee Breaks. In 2011 Bassist Rex Brown left Down to join newly formed band Kill Devil Hill. Pat Bruders of Crowbar is his replacement. Rex Brown stated that there were several reasons for his departure, mainly because of lack of passion for the project that were partially due to tensions between himself and Phil Anselmo. The band has decided to forego writing for a full length album and instead is planning a series of four EP's. Phil Anselmo explained the decision to Metal Hammer magazine: "To me, an EP is less stress for us. We have an incredible relationship in DOWN, but when we're locked up for a month or two or three, pounding out 12 to 15 songs, it's very taxing. Very emotionally taxing. So one, it's easier on us, and two, it gives the music to the people quicker."